Why choose URGO Bunions Hallux Valgus Protector? With its special shape and careful design, URGO Bunion Protector provides comfort and stability whilst protecting your bunion from painful pressure and rubbing from shoes. Supple and reversible, it can be adapted to be used on either the left or right foot, regardless of size*. Washable and reusable, the Bunion sock is discreetly hidden by your shoe whilst providing optimal protection. Pull the sock onto the foot and position the polymer gel pad on the painful area. 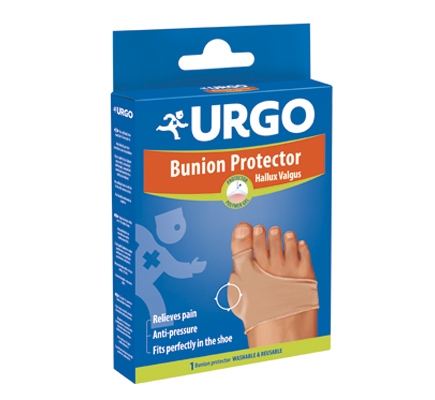 URGO Bunion Hallux Valgus Protection is a protective sock composed of a polymer gel that protects and serves as an anti-pressure and anti-rubbing barrier to help relieve the pain. A bunion or Hallux Valgus is characterised by the bending of the big toe towards the outside of the foot, normally causing visible swelling on the side of the foot. A bunion is unsightly and often painful when walking and wearing shoes. It is thus important to find a solution that can protect it effectively.